It’s not often that you meet the artisan behind the everyday dishes that you put on your table. 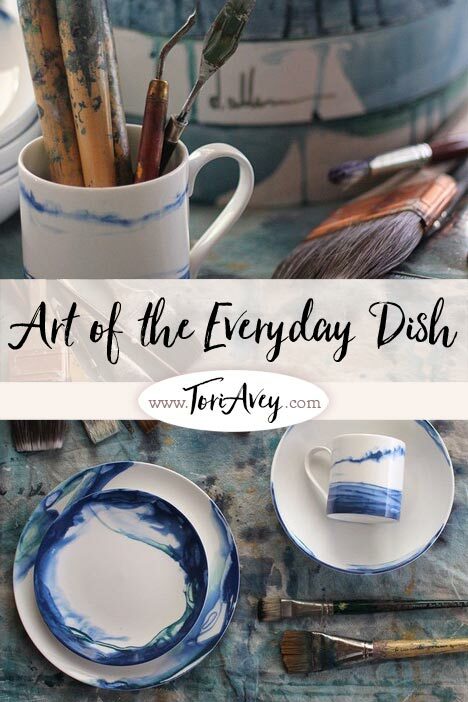 It’s also not often that everyday dishes are reflections of beautiful works of art that you might want to hang in a gallery or on your living room wall. 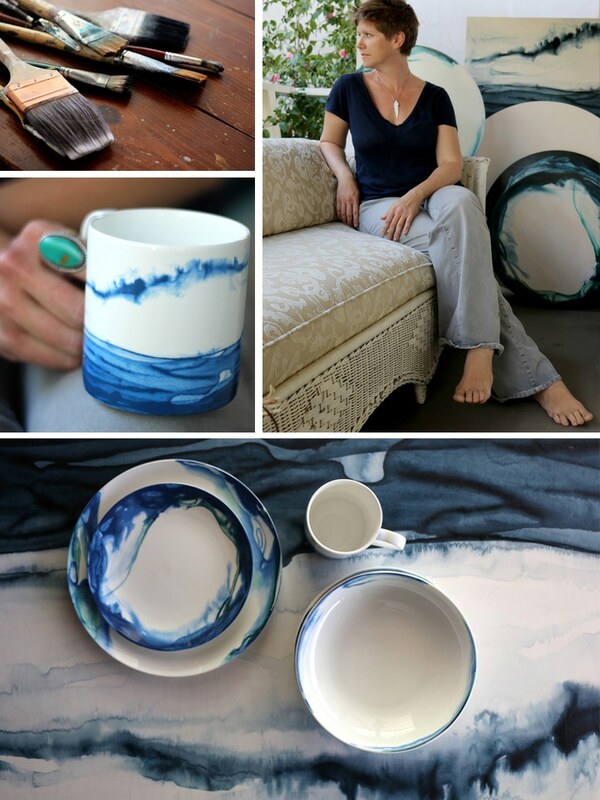 Deborah Allen, a local Southern Californian artist, has done just that in her collaboration with 1882 Ltd. – a fine bone china brand. 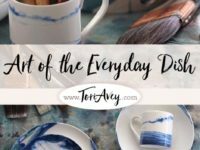 The Jenny Collection of dinnerware has taken Allen’s art from her canvases and applied it to beautiful fine bone china dishes that feel delicate, yet are surprisingly sturdy enough to be used every day. 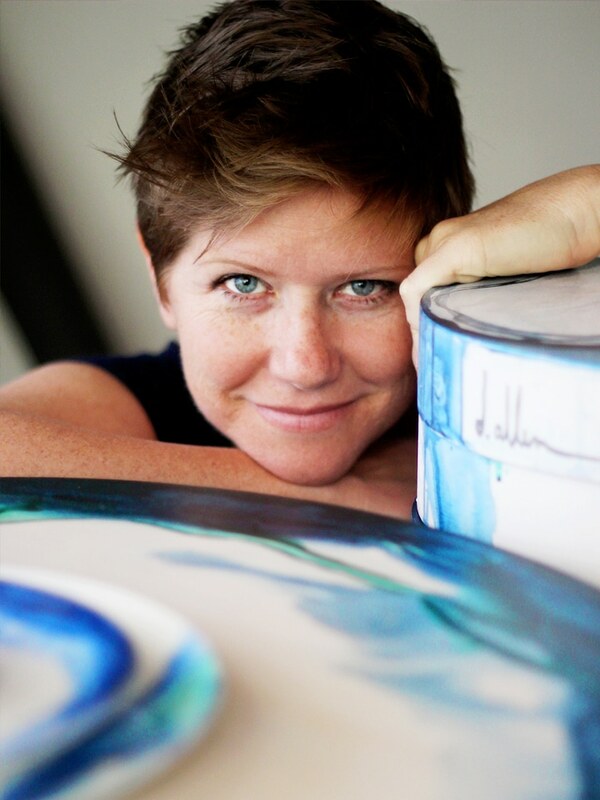 Deborah Allen, the artist behind a new line of bone china. Allen’s love of the water has heavily influenced her work. The ocean is just steps away from her studio door and she often paints outside in the open air, using the nuances of nature to inspire and guide her. Depending on the wind, light and temperature of that moment in time, the process of each piece she paints requires attention to the constant movement that paint and water make together. 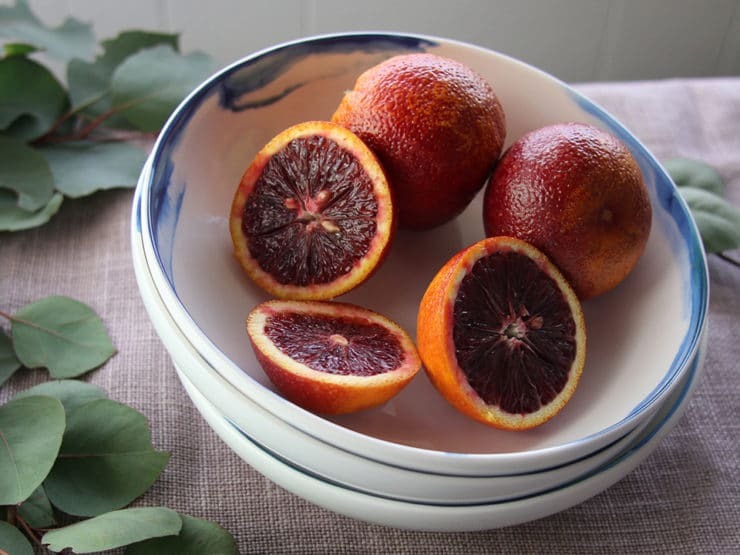 Fresh beautiful artwork like Deb’s is exactly what the makers of 1882 Ltd were looking for. 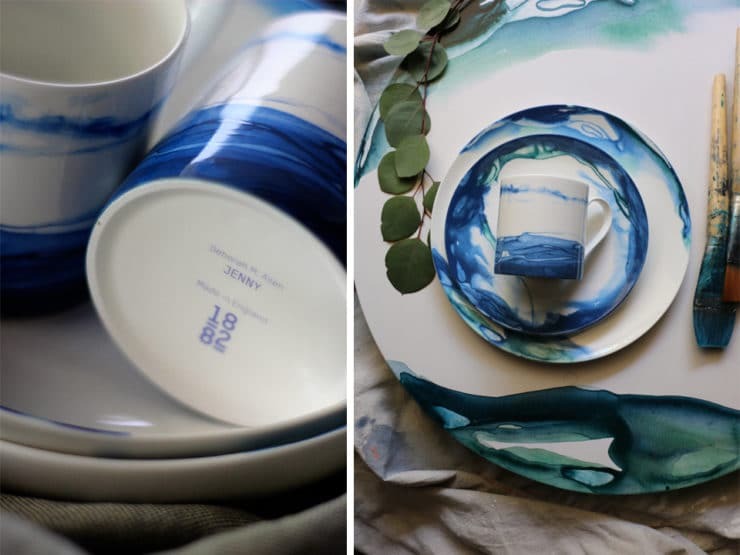 This new appreciation of fine bone china as art instead of something purely utilitarian is something that Emily Johnson, who created 1882 Ltd., has been trying to bring to the medium. By collaborating with modern artists they are infusing new life into a craftsmanship that dates back to the 17th century. At one time “The Potteries” in Stoke-on-Trent in Staffordshire, England thrived. As years went by, the craft was shipped overseas and sales declined. The industry threatened to shut down all together. However with Johnson’s entrepreneurial ingenuity, new life and attention is being brought back to the pottery business. Johnson grew up in The Potteries as a child and because of that she has a deep love for the family craft. In 1882 her family formed Johnson Brothers and began producing ceramics in the heart of the Stoke-on-Trent Potteries. Five generations later 1882 Ltd. continues the Johnson legacy by producing the bone china and earthenware where it all began. Johnson works with various factories in Stoke-on-Trent and they perform the age old craft of making earthenware and fine bone china. Naturally, being part of such a historical revival of an ancient craft is very exciting for Deb. When Johnson asked her to submit designs, Deb threw herself into the project whole-heartedly. Deb was inspired by pictures Johnson had taken as she trekked across England in a 200-mile coast-to-coast walk in support of cancer research a year earlier. Johson’s mother was fighting a strong battle against cancer herself. 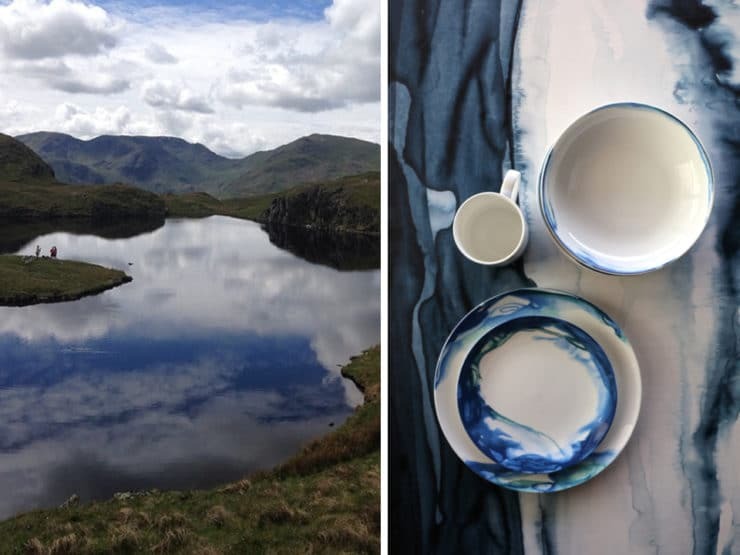 There was one particular shot from the Lake District that inspired Deb, which later became the dishes you see in this post. In the end Deb had special wooden rounds made and she painted her famous watercolor washes onto them. The salad plate and bowl were created on 24- and 27-inch wooden rounds and the mug design on a 24×54- inch rectangle canvas. The art was translated into a special lithography process, which is applied to each dish by hand. 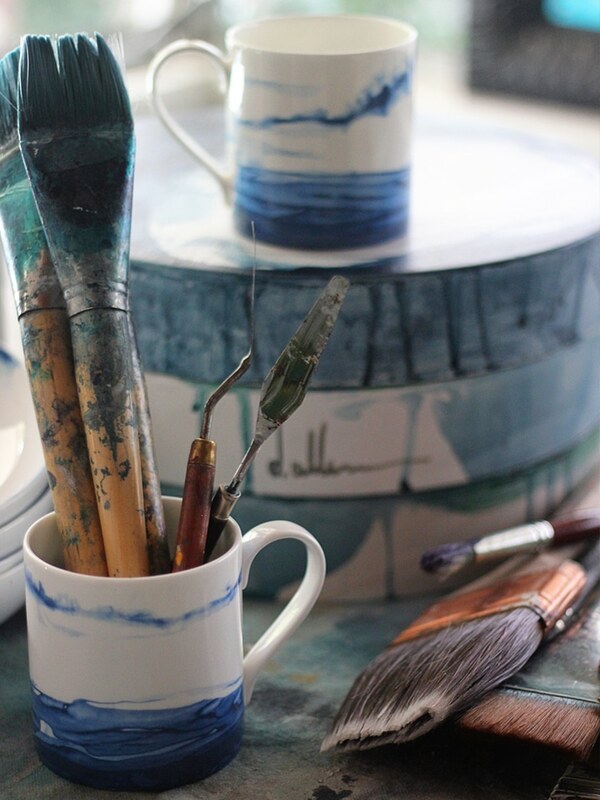 Each piece of bone china is handled by experts during every stage of the process. 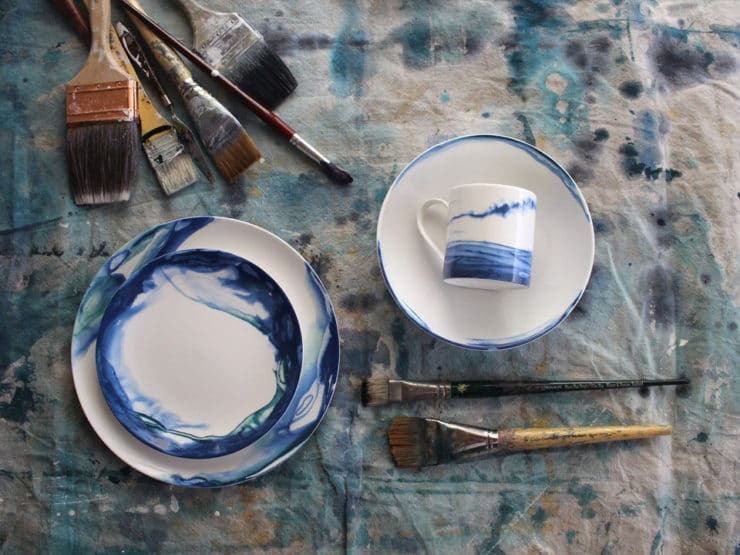 Every plate, bowl and mug are created, glazed and fired in the factory, which is in the heart of England. There is a combination of delicacy and boldness with Allen’s art that is a natural fit for the delicate yet sturdy fine bone china. This brings us to the obvious question of why fine bone china is so much more durable than it looks? It has something to do the clay and the actual bone ash that is mixed into it. Bone china also undergoes two firing processes that increase its strength. The first firing causes the clay to shrink about 20 percent, which increases its density. The second firing melts a glaze into the pores of the piece, making it even stronger. That’s not to say that you can bounce a dish off a tile floor or anything, but it is strong enough to be used every day and you don’t need to stress about every little clumsiness. We should use beautiful dishes and not hide them away! The idea of dishes being works of art that frame our food reminds me of that Erma Bombeck poem where she wishes she didn’t save that rose-shaped candle in a box where it melted. Gone are the days when we registered for sets of silver and fine china, only later to get dusty in a hope chests or dining room hutches. 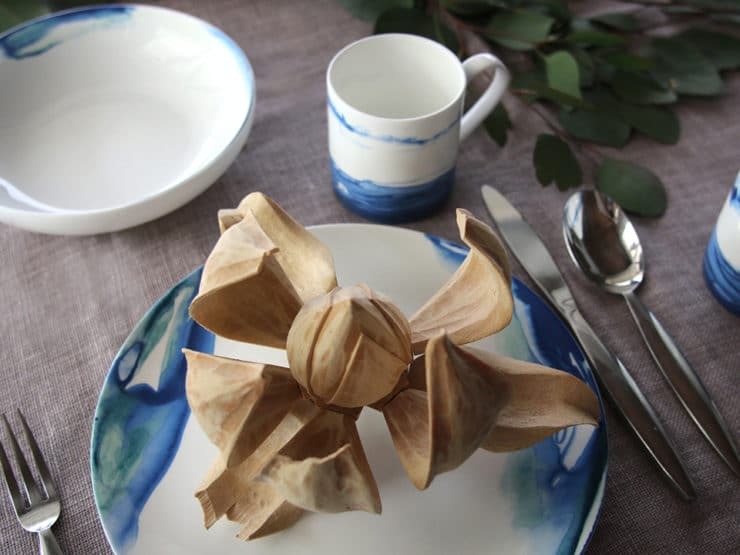 Why not enjoy the dishes and bring a bit of art to the everyday? Personally, I love throwing dinner parties and picking just the right dishes for a theme that will compliment the meal and create a story for a dinner party. Our plates literally frame our food like works of art, why shouldn’t they be art too? The Jenny Collection is available at 503found.com here in the states and at 1882ltd.com in England. A portion of the proceeds are donated to Macmillan Cancer Support in honour of Jenny Johnson. They are beautiful .. Looks like watercolor art!